Correlation might not imply causation, but imitation is the sincerest form of flattery. Since Bonds started using a maple bat to crush balls into McCovey Cove, maple has supplanted ash as Major League Baseball’s wood of choice, a fortuitous change since America’s supply of ash wood has been imperiled by an invasive beetle species. It’s estimated now that around three-quarters of major leaguers swing a maple bat, and even though that’s brought its own problems, maple’s dominance is only expected to increase. Ballplayers are a superstitious lot, and ballplayers believe maple makes for better hitting—even if the science might not exactly back it up. The early days of baseball saw a lot of experimentation, some of which led to changes that still exist to this day. Candy Cummings—so the story goes—saw the way clamshells dipped and curved when thrown and was determined to do the same with a baseball, inventing the curveball. Doug Allison took the field wearing a mitten to prevent injuries, giving rise to the glove. And bats took on many forms. There were square bats, flat bats, and Cap Anson even used a laminated bat before it was banned in 1884—the same year Bud Hillerich made a bat for ballplayer Pete Browning, the Kentucky native whose nickname Louisville Slugger would grace bats for more than a century to come. A wide range of woods was used. Shoeless Joe Jackson’s famed “Black Betsy” was hickory, as was the bat Babe Ruth used to hit 60 home runs in 1927 (a Louisville Slugger model borrowed from Lou Gehrig, Redman says). The Boston Red Stockings in 1873 and ‘74 used willow bats, no doubt a reflection of baseball’s origins in the games of rounders and cricket, which also used willow. Maple was used in baseball’s early days too. “There were instances when maple was tried, but it never really caught on, and I couldn’t tell you why,” Redman said. But by the 1930s, ash had become nearly universal—because of its durability and ubiquity, says Major League Baseball’s historian, John Thorn. 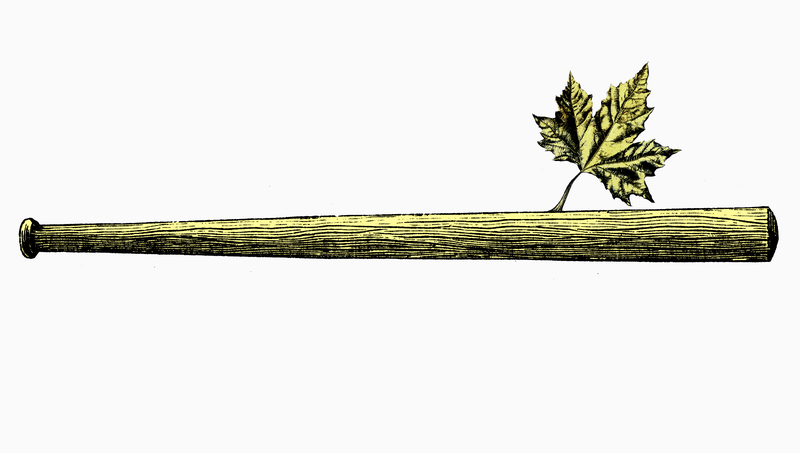 Boning—as you might or might not infer—is rubbing a bone against the barrel of a bat to scrape off the veneer and harden the wood. There’s a famous photo of Joe DiMaggio doing just that. In 1941, when DiMaggio hit in 56 straight games and Ted Williams hit .406, they used ash bats. When Mickey Mantle won the Triple Crown in 1956 and Roger Maris broke Babe Ruth’s record five years later, they used ash bats. And when George Brett came screaming out of the dugout for having too much pine tar on his bat, that bat was, yep, ash. But players didn’t just use ash because it was available. They used it because they liked it. “I loved the feel when you made contact on the sweet spot,” said Jim Thome, who hit 612 home runs in a 21-year career, just about all of them with an ash bat. Though the substance of the bat generally remained the same—MLB rules only state that the bat has to be solid wood, no longer than 42 inches and no more than 2.61 inches in diameter at its widest point—the style of the bat changed significantly through the game’s history. Bats from the early 20th century resembled nothing as much as clubs, thick-handled and heavy. Honus Wagner, the first major league player to sign an endorsement deal with Hillerich & Bradsby in 1905, swung a bat around 43 ounces. Ruth swung bats as heavy as 52 ounces in his career, Thorn said. And Heinie Groh used a 40-ounce bottle bat, which resembled a cricket bat, with a small handle that ballooned out to a wide head. Thome says one of the coolest parts of his induction into the Hall of Fame this year was the tour of the museum, particularly when he saw the different types of bats on display that showed its evolution through the game’s history. It’s difficult to overstate how much Babe Ruth’s power hitting changed the game of baseball—along with a more subtle change that happened as a result of the only fatality from an injury in a major league game. Ray Chapman’s fatal beaning (which happened against the Yankees in the Polo Grounds, with Ruth in right field) led to the banning of the spitball, and umpires became quicker at taking a ball out of play. As a result, balls were suddenly easier to hit over the fence. “In the deadball era, no matter how hard you hit it, it was unlikely to go out of the park,” Thorn said. “If you hit it hard up the alley, you had a chance at a triple. Remember the triple? Baseball is like comic books: Everything comes with an origin story. Ken Harrelson’s blistered hands from a golf outing begat the batting glove. A cold day at the Polo Grounds led to the sale of hot sausage sandwiches, which became hot dogs because a cartoonist couldn’t spell dachshund. And MLB’s maple bats began with a conversation over beers in Ottawa. Bill MacKenzie, a baseball lifer then serving as a scout for the Colorado Rockies, was drinking at the Mayflower Pub in Ottawa with Sam Holman, a former stagehand with the National Arts Center in Ottawa who did some carpentry. MacKenzie said ash bats—by then made with thin handles and thick barrels to maximize power and bat speed—kept breaking. Was there anything Holman could do? “I’m not going to make a better ash tree,” Holman realized. From there, Holman went to Toronto and found several Blue Jays players who were willing to try it out. Joe Carter instantly connected and soon started singing the praises of the new maple bats. Carter finished his career with the Giants in 1998. While there, he evangelized about the maple bats to Barry Bonds. The following year, Holman showed up in Giants training camp with a new maple bat for Bonds. The rest, they say, is history. Bonds hit his first 400 or so home runs using Louisville Slugger ash bats, but he had switched to maple by the time he hit the two big milestone homers of his career: No. 73 in 2001 and no. 756 six years later. When Albert Pujols knocked in 130 runs for a National League rookie record in 2001, he did so with a maple bat, as did Miguel Cabrera in 2012 when he became baseball’s first Triple Crown winner in 45 years. It’s not hard to see the biggest problem with maple bats. The evidence usually consists of about a dozen pieces. It’s not hyperbole. In 2008, more than one in three bats that broke in Major League Baseball broke into what were called “multi-piece failures,” potentially launching sharp-edged pieces of wood toward fans, umpires, or other players. Or if you were even near the field. In 2008, Pirates hitting coach Don Long was in the dugout when he was cut with a shard of maple at Dodger Stadium. A few days later at Chavez Ravine, a fan sitting behind the visitors’ dugout was hit in the face by a piece of the barrel of Todd Helton’s bat during a game against the Rockies. There was even talk of an outright ban of maple bats, but what happened instead is that manufacturers—which had bloomed from eight when Holman was making his first maple bat to more than 30—started paying more attention to the wood. Redman says Louisville Slugger does a test measuring what’s called the slope of grain, which influences the possibility of the bat breaking. Zero degrees slope of grain is optimal, but no bat used in a game has a slope of grain—tested by dropping ink on the billet, the round cylinder that a bat is made from—more than 3 degrees. Bats that do have a lower slope become souvenirs, since they can be displayed but most likely won’t have to stand up against a 100-mph fastball. As maple rose to prominence, ash faced an existential threat. In 2002, scientists discovered the emerald ash borer, an insect native to northeastern Asia, in southeastern Michigan. The beetle eats the tree’s leaves, but the females lay their eggs inside the tree—and the larvae tunnel through the tree, feeding off it and ultimately killing it within one to three years. By 2016, the emerald ash borer could be found in 25 different states—including New York and Pennsylvania, home to most of the ash trees used for baseball bats—killing an estimated 50 million ash trees in the United States. Maple bats, all other things being equal, are more expensive than ash, but the emerald ash borer is making ash scarcer, to a point where, Rathwell said, ash might become as expensive as maple. Today, Redman said, about 75 percent of major leaguers swing maple bats. About 20 percent still swing ash, and about 5 percent swing bats made from birch. Thome used maple on occasion (he, like many players, would use it in batting practice; one maple bat could last an entire season), but remained mostly faithful to ash. And that’s really the big question: Are maple bats better than ash?